Life is a BEACH are you Having Fun? While walking along a quaint little street in Cape May New Jersey I came across a bed & breakfast that had these shells on the fence. 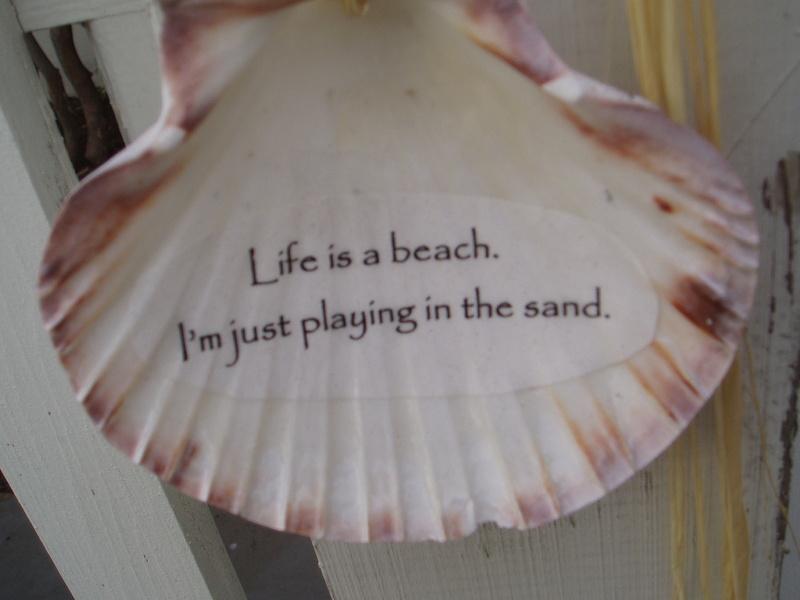 Each shell had a different saying and when I saw the one you see on this blog it reminded me, as I hope it will remind you, that although there are times of challenge and growth, life really is like a beach and you get to play in the sand! So many times we get caught up in day-to-day challenges, worrying about the future, or trying to resolve the past we forget to have FUN! Life is cyclical like the ebb and flow of the tides. Sometimes there are storms that churn the waters and destroy those beautiful sandcastles you’ve built. You can dwell on the destruction or you can choose to notice that the sand you built them with is still there. It is merely smoothed out so you can build a bigger and better sandcastle! What if every day you went to the beach to play in the sand? Do you approach each day looking forward to it as much as you look forward to a vacation? Do you watch with neutrality & amusement and stand your ground as the waves hit the shore or do you get swept out to sea? There is so much life to experience, so why not have fun doing it? If you haven’t been having much fun these days, why not? Where is your attention? Are you remembering to have fun? If you’re not having any fun it’s time to explore how you choose to view your beach. Do you see it as a place with sand that gets everywhere constantly needing to be brushed off or a place to create sand castles? Are the impending storms a thing of beauty or is there fear of the destruction? Are you protecting your beach and hanging on so successfully that there are limits to having fun or what you can build? While life isn’t always a bed of roses, you were born on this earth, at this particular time, for a reason. If you consider each moment a learning experience and let go of the stuff that doesn’t feel good you will soon be having fun and playing in the sand again. It is that which you hold on to and how you choose to experience it that makes the difference. You can’t contain the ocean or control the weather. The sun rises and sets each day. There is flow and movement whether you want it or not. You can fight the waves and struggle or you can play in the sand. You can explore the coral reefs or you can be swallowed up by the waters. Previous Post Caring for your most intimate relationship…. what a great reminder, thank you!! it’s funny (well, actually not funny, but odd/backwards!) that we so quickly look over that idea of “fun,” shouldn’t that be higher on the assesment list!!? great post, thank you! !